«©NCSX» Banpresto knows its audience. Year after year, the company publishes Super Robot Wars games, manufactures hundreds of plushes, and peddles pretty much every toy under the sun. 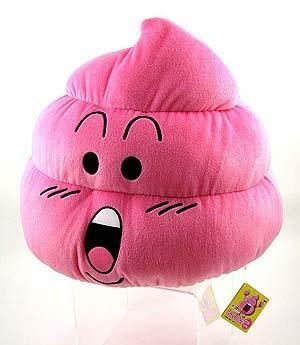 Since Banpresto is innately in tune with the market, they've announced a very large cushion which is based on the Mr. Slump Unchi-kun character who lives in Senbe Norimaki's toilet. Measuring a massive 30cm or 11.81" tall and nearly as wide, Unchi-kun is colored pink and is blessed with a facial expression that only select members of the general population can appreciate. All preorders and new orders will ship today at US$33 per plush. In Japan, a pyramidal coil that terminates with a little point on top is called unchi.